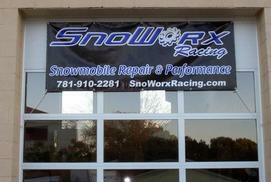 SnoWorx Racing has expanded and now has two locations to choose from to make servicing our customers more convenient​ and cover more of the Northeast territory! Same great quality and service are given at both locations! Where it all started! This is the original SnoWorx location where the dream and idea took off, making the remarkable name and reputation of SnoWorx what it is today! ALL machines are stored indoors, unlike most places. The shop is one of the cleanest around packed with all the right tools and equipment to do the jobs right everytime! 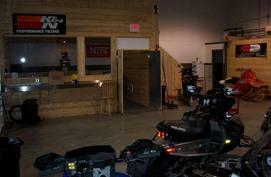 SnoWorx new location to serve all the MA and southern NH/ME riders. This location is right on RT. 1 south just after the 114 exit. The shop is BRAND NEW with all new equipment and tools to perform some of the most wildest projects imaginable! Once you step in the door and see how clean the shop is kept, you'll have no doubts on what to expect for work quality. Again ALL machines are stored in doors at this location too. Our showroom will have common parts in stock, as well as parts and accessory ordering! This location is where we will be performing Motorcycle, PWC, Powersport, and Auto repairs/modifications also. 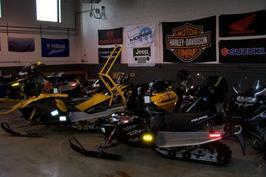 This is truly a one stop shop for ALL your motorized needs!